Bryce Canyon National Park hosted its 16th annual astronomy festival began June 1, 2016. 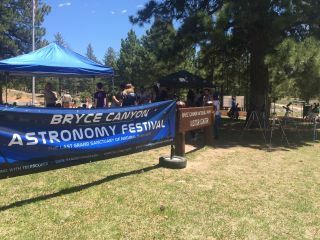 BRYCE, Utah — Here at the annual Bryce Canyon Astronomy Festival, daytime is just as entertaining as night. On the lawn of the Bryce Canyon National Park Visitor Center, kids stomped on 2-liter soda bottles, which rapidly pumped air through plastic tubes that then sent paper rockets flying sky-high. Well, not quite sky-high, but high enough that the kids cheered. This was one of a handful of daytime activities the park put on as part of its annual astronomy festival. During the nighttime stargazing parties at the four-day festival, volunteers from the Salt Lake Astronomical Society (SLAS) set up telescopes for visitors to view planets, galaxies and nebula — on top of the already-stunning view available to the naked eye. But a few volunteers also showed up during the day to set up sun-viewing scopes — telescopes with filters that show a limited amount of light from the sun, making it possible to see sunspots and other details on the surface. Sun observing during the day at the Bryce Canyon Astronomy Festival. Each evening, there are three concurrent astronomy-related talks. One of the venues is an outdoor amphitheater by one of the campgrounds. As the presenters reference specific stars and constellations, they can point them out to the audience. Amateur astronomers setting up telescopes at the Bryce Canyon National Park. Volunteers with the Salt Lake Astronomical Society brought the telescopes to the festival. The star parties begin around 10:30 p.m. each night in a dirt parking lot a mile from the main road, right next to the rim of Bryce Canyon. Despite the veil of complete darkness, the bustling vibe continues. About 25 telescopes were set up by SLAS volunteers, and every half-hour, a presenter gives a short tour of the visible constellations. Don Colton, the SLAS volunteer coordinator for the festival, told Space.com that at past festivals, the star parties have drawn about 600 to 800 people per night. On Thursday, the crowds began arriving before 10 p.m., and there were easily 600 people there by 11 p.m. Shuttle buses to the star field arrived every 15 minutes, packed to the brim with visitors. The new arrivals would then wander among the telescopes, stopping to peer at some celestial object and hear a bit of astronomy trivia from the volunteers. Jupiter was an early target because it was high in the sky; Mars and Saturn gradually rose up to good altitudes for observation. The Milky Way appeared to the east, lying horizontally across the sky and along the rim of Bryce Canyon. The crowd buzzed, but the surrounding wilderness swallowed up the sound, and the sky took center stage.